Years before Wentworth officially became a town settlers had been taking up residency in the vicinity. The majority of the settlers had come from Milwaukee, Wisconsin, Minnesota, Iowa and other eastern states. A name was not agreed on for quite some time. The different names disputed over included Milwaukee, after the hometown of the Wisconsin settlers, some wanted the name Wicklow and still others wanted Alto after the railroad camp 2 miles east of the Wentworth. Wentworth was finally decided on. Nell Wentworth’s quarter of land was where the town grew up on, but it was not named for him but his father George Wentworth. Charles Kennedy surveyed the town on December 15 and 16, 1880. Kennedy was a surveyor, real estate dealer, and banker from Madison. The Chicago, St. Paul and Milwaukee railroads all came into South Dakota in 1880 – 1881. Locations of both Wentworth and Madison were determined by the coming of the railroads. Trains only made a few trips before the snow halted any more train visits. February 25, 1881 was the first train after the storm. 3 loads of fuel, along with an engine and snow plow. It made it through Wentworth. The supplies were delivered to Madison but the train didn’t receive any supplies. The Madison Sentinel Record reported, February 25, 1881, that supplies were getting low. All hay had been burned for heat and the straw was the replacement. Most of the town ran out of flour, substituting barley and wheat ground in coffee meals to get by. According to records the next train to arrive wasn’t until May 6th. The late arrival was due to late spring flooding, which had washed out the majority of the eastern South Dakota rails. May 27th of 1881 brought the first train of lumber, which built the Birdsell Hotel. The railroad built a temporary depot and a permanent 80 foot platform. This depot was built in 1905-1906, just east of the junction of the Great Northern, Chicago, Milwaukee, and St. Paul. Mr. Stephenson was agent for the Great Northern while Mr. Jones was for agent the Milwaukee. The job was combined in 1919. 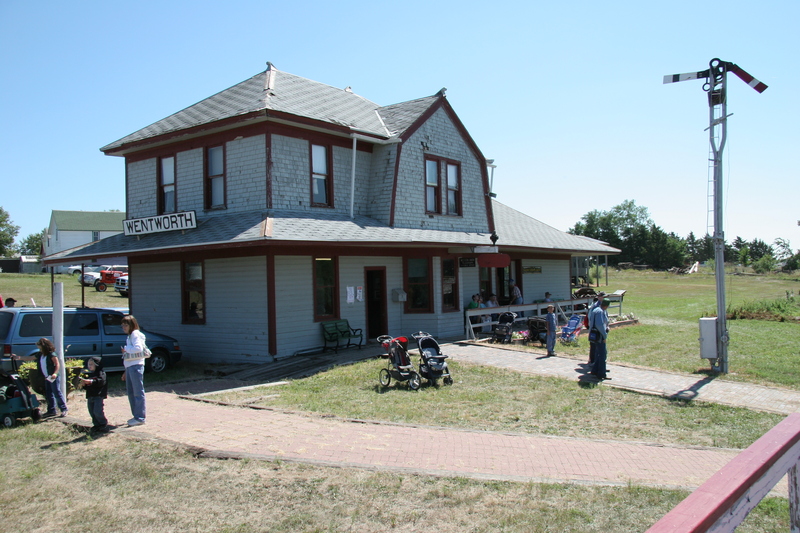 This is the only remaining Union depot in South Dakota and was used by the Milwaukee and Burlington Northern Railways at Wentworth. It is used here at PV for all of our train arrivals and departures.